It left the Holywood man seven shots behind joint-leaders Francesco Molinari, Jason Day, Brooks Koepka, Adam Scott and Louis Oosthuizen (all seven under) heading into the weekend in Georgia, USA, - and off the pace as he attempts to complete golf’s grand slam. After posting a one-over-par 73 on day one, McIlroy found himself seven shots adrift of Koepka and Bryson DeChambeu following their opening 66s on Thursday. But his bid to reduce the deficit and place himself within touching distance ahead of moving day failed to take off as he remained seven shots off the leading pack on level par. That was despite a breathtaking eagle at eight and two eye-catching birdies at six and 16, with bogeys at the second, 11th and 13th proving his downfall - the latter following a suspension of play due to an incoming storm with McIlroy on 11. The threat of lightening in the skies above Augusta failed to materialise, however - just like the Northern Irishman’s anticipated charge on day two. 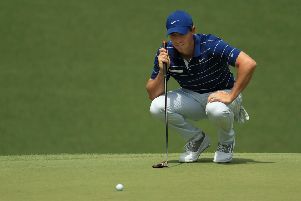 It’s fair to say, McIlroy’s failed to make the immediate impact he was hoping for as he started day two one over par. He had an opportunity for a birdie on his opening hole but saw a putt from 34 feet trickle agonisingly past his intended target. Then he found himself heading in the opposition direction on the scoreboard, bogeying the second which is normally easy prey for big-hitters such as the world number three. Something had to give if McIlroy was to make an impression on this year’s event - and it did on the sixth, with the 29-year-old’s tee shot pitching to four feet from the pin to set up his first birdie of the day. With the large galleries getting excited by the endeavours of home favourite Tiger Woods and Jon Rahm in the group immediately in front, McIlroy’s band of loyal followers amongst the patrons finally had something to cheer about. And those excitement levels were turned up a notch on eight when the four-time Major winner hit his second shot at the par-five to within eight feet of the pin, setting himself up for a much-needed eagle. That mammoth effort saw McIlroy make the turn in 34 shots - two under for his round and with the momentum he craved finally with him. Then came the half-an-hour suspension of play due to the treat of severe weather approaching the Augusta area - a break in play that was immediately followed by his second bogey at this year’s Masters at the 11th. As the rain fell on the already well-sodden playing surface at Augusta, McIlroy would have been wishing that play had been abandoned altogether rather than temporarily stopped as he proceeded to miss an eight-foot birdie putt at 12, before following that up with a bogey at 13 after finding Rae’s Creek with his second shot. And just as momentum appeared to swing in his favour between holes six and eight, it had now swung in the other direction - much to his frustration. A birdie at 16 following a 50-foot putt would have given him a crumb of comfort just when it appeared all was lost. But overall McIlroy will be frustrated that his name isn’t embedded among the leaders when play resumes tomorrow. Although, with 36 holes left to play, there’s still enough golf to be played to change that.